My iPad arrived today at 1pm via UPS and I’m so happy! The apps look amazing on this device that it’s very hard to go back to the iPhone.. It’s been a busy app-testing day for me! Here’s my iPad unboxing video. The original blog post by Chris Pirillo made me blush! Thanks so much for the kind words. I do have one correction to make. The AR.Drone actually runs on the wifi network, not bluetooth as I previously thought. And this is the Hello Kitty iPhone game that I enjoy! This video was created using the very cute easy-to-keep-in-your-purse Creative Labs Vado HD Pocket Video Camcorder, 3rd Gen and the always useful Joby Gorillapod Tripod ! Many thanks to Albertech.net for the video and photo! Pattie Maes from MIT, talks about a technology that can act as our Sixth Sense. “It’s a wearable device with a projector that paves the way for profound interaction with our environment. Imagine “Minority Report” and then some. I loved the technology in “Minority Report” and seeing it come to life in the near future is quite amazing. Watch the video to see what may be in our lives in the near future. Original Video is from Ted Talks. 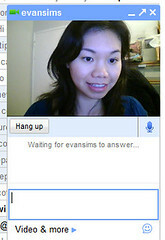 I finally got the chance to test out Gmail Video Chat today. I wanted to the other day, but the option didn’t appear on my account until earlier this morning. I first tried to call @evansims, but his speakers were muted, so he didn’t hear! So that’s me waiting by the gTalk for him to pick up. 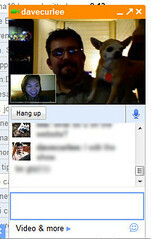 @davecurlee saw my tweet about testing Gmail Video Chat. So we logged on and played with it. And my college friend, Jimmy, also showed me around his new place via Gmail Video. That was pretty neat. Video is very clear in the little chat box. If you hover on the top left and click on the arrow, you can maximize the video! Pretty neat. It may be a little pixelated though, depending on your monitor size. Your video on the bottom right side can also be moved around. It is somewhat of a bandwidth and memory hog, but an amazing addition to the web app nevertheless. I can’t wait to see this implemented into the Google Talk client version. To install the plugin, go to the Gmail Video Chat. ps. @davecurlee‘s chihuahua’s name is Leia! Just wanted to thank Viddler for hosting my Hawaii vacation videos! My friend just showed me this DXG-567V High Definition Video Camcorder 2″ High Resolution TFT Screen. Wow. There’s a $30 rebate on it from Costco too, bringing it to $99.99. I wonder how it compares to the Flip Mino. I’m already sure it’ll blow away the Creative Vado, which is the same price, and not HD. If anyone has one, please let me know how you like it!